64 no. : ; 28 cm. 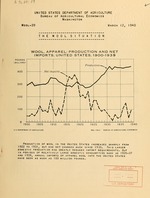 WOOL-1 (Jan. 1937)-Wool-64 (Apr. 1942). No. 1 called new series. HAVE BEEN AS MUCH AS 100 MILLION POUNDS. pulled wool by about 190 million pounds. good quality wools in those countries are reported to be clearing rapidly. slightly larger than in December and was 9 percent larger than in January 1939.
held at the beginning of 1938.
were somewhat irregular but quotations on most grades were largely nominal. is little information concerning prices for new clip wools. Zealand, Argentina, ald Ur. i,-. ; .- in 1939.
there is little information concerning prices for new clip wools. cents a round higher th-n prices reported for the week ended February 3.
the week ended March 2 :.nd 39.5 cents a month earlier. prices were about 35 percent L.i<'. r than a year earlier. consumption in the 10 years 1929-38. 551 million pounds of shorn wool and 79 million pounds of pulled wool. be offered by mills in March. equivalent 54-inch yardage. The 119 mills are equipped with 27,000 looms. 1/ Reports are for specified dates near the begi !.ii-,g of each quarter. carpet wool, were the largest for any month since March 1937. Cm,-iled from Monthly S3-,-- r.r of Foreign Commerce, December 1939.
more than 50 million pounds (grease basis) a month, from April through January. : i b.lb. l. lb. Mil. lb. figures from the Bureau of the Census. 1/ Weight as reported, greasy, scoured and skin wool added together. / Bureau of the Census figure adjusted to 52-week basis. influence on domestic mill consumption of wool. ports in 1940 are relatively largo. Control. The United Kingdom has purchased the entire clip of 7. 'u Zealand also. available for export to neutral countries. now arriving at selling centers are chiefly short wools. in the same months last season. Recoipts also were smaller than a y.c-.r earlier. smaller than averIgc January 31 stocks in the 5 years 1934-38. 1- Irlud- ..'.icsl'.c rid private sales and wool shipped unsold. shipment, wor lgo in Janwuay. 2 million pounds annual-l.y from 1933 through 1937.
: Apr : Jan. : Feb. : Oct. : 1cv. : D. Jan : Feb.
American Legation in South Africa. I/ Quotations are in cents per pound, clean basis. T/ Season begins July 1.
: Mil. lb. Mil. lb. Mil. lb. Mil. lb. wool, totaling 824,000 pounds not yet available by countries. 3/ Includes exports of scoured wool not reported by countries, for January. February 16 were about 20 percent higher than in the first week of January. stocks of these grades at Montevideo were reported to be small. Compiled from weekly reports of Cn-asara r.I-rcantil de Productos del Pais. (65.8300 cents per peso for period shown). I/ No quotations available. 2/ T:o 'eoks only. purchases in Uruguay in the current season have been larger than '..uil. by classes from October th:.-o :i. January of the last three seasons are shove. in the 'ccoup-. '.yi g table. :Mil. "b. Mil. lb. Mil. lb. Mil. lb. Mil. lb. 2/ Not reported by classes. 1938 total apparently was exceeded in 1939.
of South Africa was about 50 million pounds smaller than in 1932.
largely in the country where produced. wool production by countries, 1934-39, is show in table 2.
the Agricultural Marketing Service. Production of shorn -cool totaled. 377,7`7,000 pounds in 1939 and production of pulled wool 64,C'0,000 pounds. 1938,*-ith the greater -t of the increase in the native shecp States. shorn wool, by States for 193S and 1939 are given in the -cco~mp. 'anying table. I/ Includes sheep shorn at commercial feeding yards. Tc;-'l ou 1iri .r ..: 571-. 5., .- 6:,5.7 5.' 6 24..
Yortherrn Tr: 1' ........ .
Total Ir. it: d V! :in dcr . 11. 1 .0 1 e:.6 I 1 .0 17.6 19. 31.1 2.1 33. 34.6 25.8 . Rumania ..... .............. .: 68.0 .60.3. China 11/ ................... .:, *- ,.r ...i f.,.::. 5, 7:'r..- ',-r ,:, '.,ir'..
do not publish official wool production f1-'..-: production has been estlim;:ted. countries at its grease equivalent. Figures in parentheses interpolated. boundaries of Germany, Austria, Czechoslovakia, Eungary and Poland. 1/ Preliminary. Figures for" earlier years may be revised on the basis :-. 6/ Estimates of the Buenos Aires Branch of the First Natibnal Bank of BPostn. :,- ze on exports, domestic consumption and carry-over. / Estimates for Asiatic countries are rough approximations. 8/ Estimates published by the Banquo Centrale de la Turquie. II/ Totals rounded to tens of millions. the world production excludingg Soviet Union and China) in 1-,..
Africa and I::L. Zealand; October 1 in Argoiti.-a and Uruguay. Pulled wool included for most important countries at its grease equivalent. wool averaged about 20 million pounds a year in the last 10 years. of wool purcAased by domestic mills, all converted to a ,rT . 'r basis. Adjustment made for stocks in 1926-27 and subsequent yoers. made for stock's subsequent to 1911.
mates of production taking consumption and stocks into account. SPublished as reported by oulleries and is mostly washed. Estimates for seasons 191'-17 to 1923-24 are those of Dalgety and Company. not been converted to a grease besis. exports, local consumption and carry-over as reported unofficially. skins, wool consumption and carry-over all converted to a grease basis. :1938: 1939: j/' Feb.: Dec.: Jan. :Feb.
which is a weighted average. SWhite 13-15 denier, at New York, Bureau of Labor Statistics. 5/ Domestic yarn, first quality, Bureau of Labor Statistics. machinery ti.it;r from the Eureau of the Census. L/ Weifit of c-re-y, scoured, and skin wool added toz thc-r.
based on 53 weeks. I0o adjustmentt made for holidays.